Sally, Kari and I are going tonight and I am really excited about this performance. 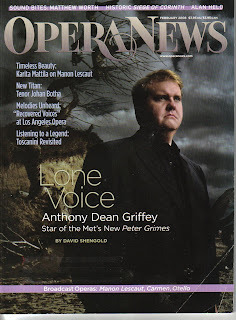 It's my first Peter Grimes and I've been told that the music is extraordinarily gorgeous. It's my first time to see Anthony Dean Griffey perform live*. I've only seen him in the broadcasts of A Streetcar Named Desire and The Rise and Fall of the City of Mahogany, but I've met him. Sally and I also went to the Guild Talk for Peter Grimes. I'm also thrilled to see one of my favorite sopranos, Patricia Racette perform again. Mezzo-soprano Felicity Palmer and baritone Teddy Tahu Rhodes round out the cast. A Florentine Tragedy last October. Teddy Tahu Rhodes ROCKS. I was drooling after I saw him last weekend in Grimes. Hope you had a wonderful evening!